Although lid fell off the hinges, it still works! Few people know about my prayer box. I started it my last year of teaching (2008) when I realized how awesome the task before me and the many challenges that were set up against my students. So I wrote down each and every child’s name that I have touched during my 5 years as a teacher on an index card and placed it in a box. I also added in family members and friends that I felt compelled to intercede for. I did good for awhile, picking at random 3 index cards a night (each with the person’s name on it) and writing at least 3 specific items to pray for on that person’s behalf – healing from past hurts, nurturing of a specific gift, etc. I’d then pray for each person. For Lent this year I decided instead of giving something up I was going to add something in. 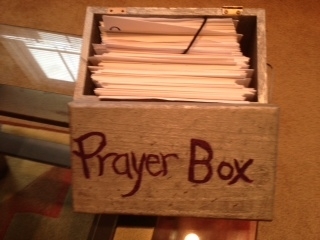 I decided to begin praying for those in my prayer box. I picked up where I left off and began praying earnestly for all my students in general and then specific prayers for the 3 individuals for that night. I’m pretty cool with not needing to see the results of these prayers, just relying on faith that the Lord will take care of each of them. Indeed it does! A happy Starbucks moment!